What an exciting end of the month view it is, as we slide seamlessly from winter into Spring. Proper, frothy, blossomy Spring. I feel giddy with excitement and I'm sure I can feel the ground boiling and heaving with all that growth going on down there. 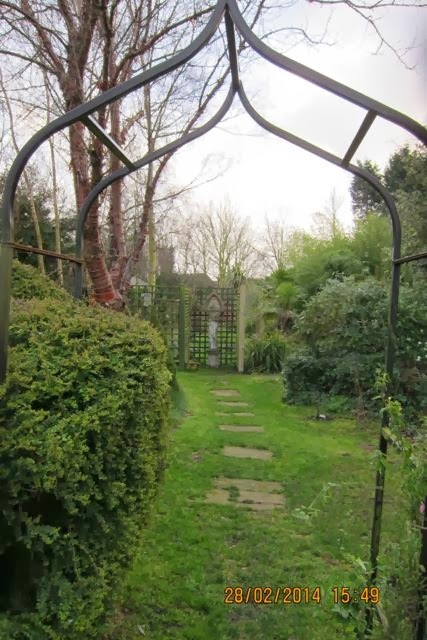 We can take a stroll from the stream at the bottom of the garden, if you like, and meander up to the garden, until we reach the house, where we can have a cup of tea. If we want to celebrate the tipping of the season, we could always have something a little stronger. A little sherry perhaps ? 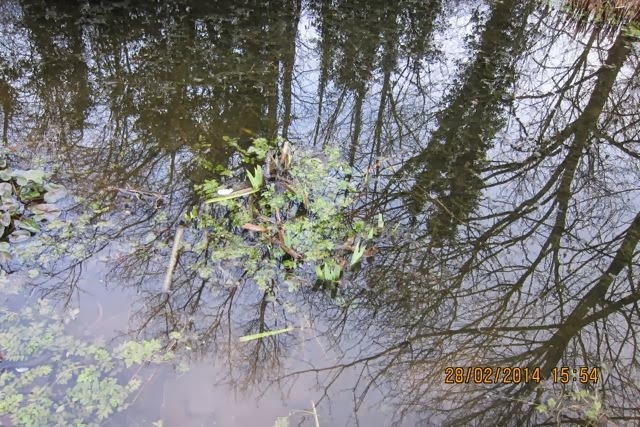 Although the water in the pond is still decidedly icy, it must be warming up to some extent, as aquatic plants have started into growth. The sticklebacks are very active now, and there are tiny flashes of silver as they dart through the water. I keep looking for the big eyes of the frogs, watching me in total stillness from the margins, but as yet it is too early. I know from the myriad of forums and blogs that I spend far too many hours on, that there is frogspawn already, in ponds further south. Here in Lincolnshire we are still waiting. The next section looks fine now, as it just sports a few bonfire piles of brash, but, it has been much more dramatic over the last month. 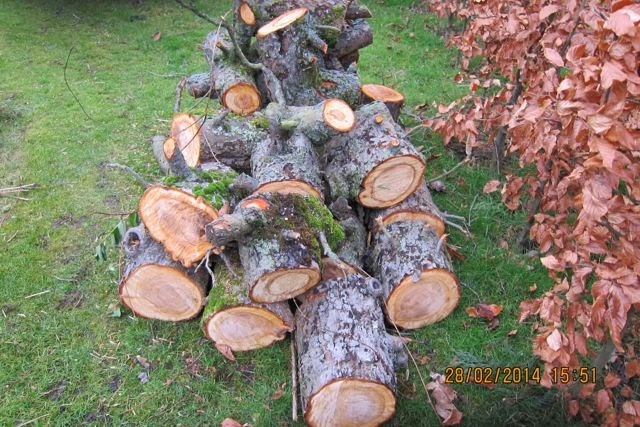 It held the fallen Bramley apple tree which blew down in a gale a couple of months ago, then that tree was joined by a HUGE conifer from next door, which was uprooted in a gale a couple of weeks ago. It crashed through the beech boundary hedge and wedged itself behind the garden gate, so we could hardly even get access. 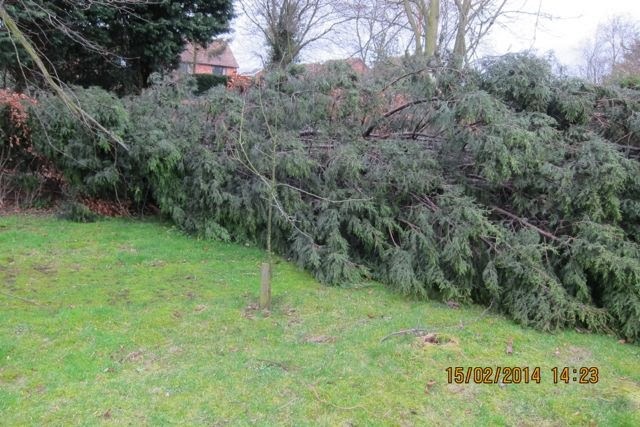 The orchard area was completely taken up with two large fallen trees. Luckily, a (very reasonable) man with a chain saw spent a day logging them both, and all we have left now is fodder for the open fire. 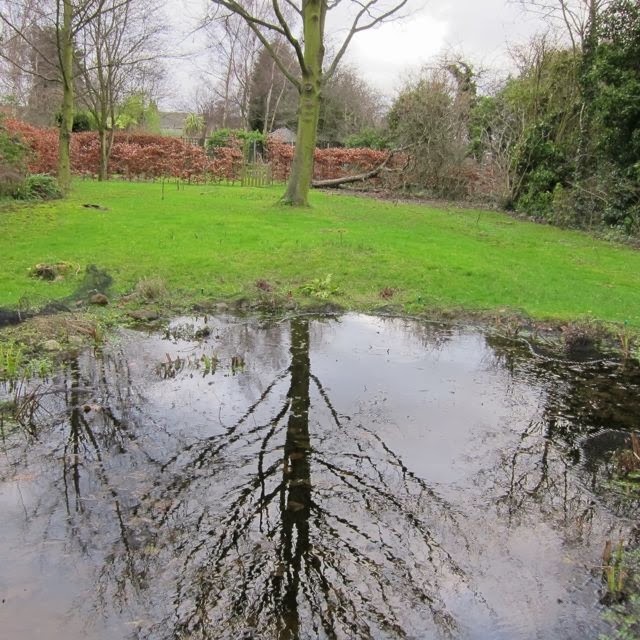 Walking through the exotic garden and into the ornamental pond garden, it is noticeable that things are being kickstarted into growth. This rose, Reinne de Violettes, was planted at the back end of last year, and is obviously very happy with its new home, as it has put out lots of fresh, new growth already. 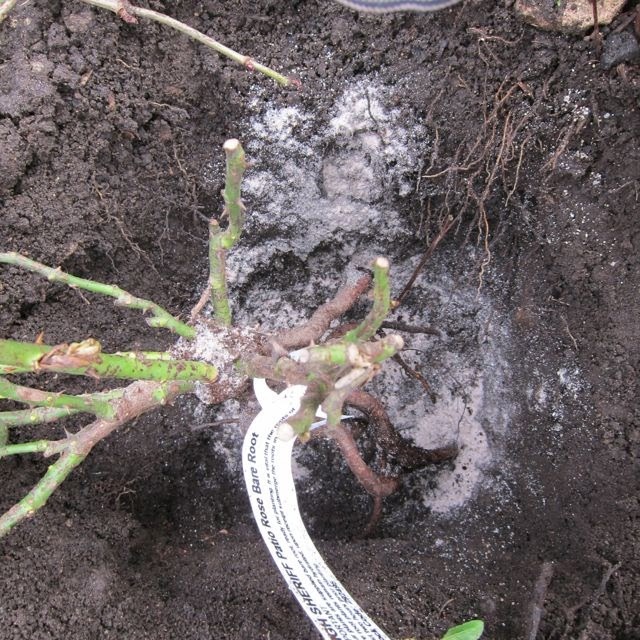 All my new barefoot roses, both old roses and Patio roses are showing leaf buds, so I assume that they are building a good, unseen root system. 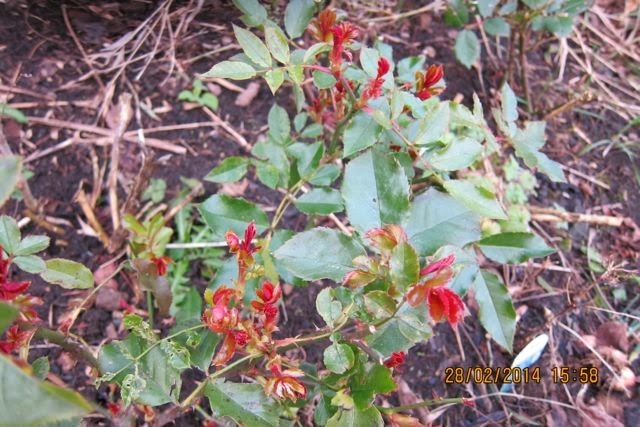 Some of the roses are showing beautiful, dark red, new growth which is very attractive. Chainsaw man was invited back for another day and he topped off a holly tree near the house, an unruly Viburnum Tinus and a Box hedge which thought it was a tree! I am doing my utmost to let light and sunshine into my south facing plot, to maximise the happiness of all my roses ( currently numbering about 200. Eek! Must stop! Need help fast!). The Exotic Gardener (aka partner who, sorry to disappoint, oversees the Exotic garden!) has already got the mower out this year. A little too eagerly, I thought, but he seemed to enjoy himself. 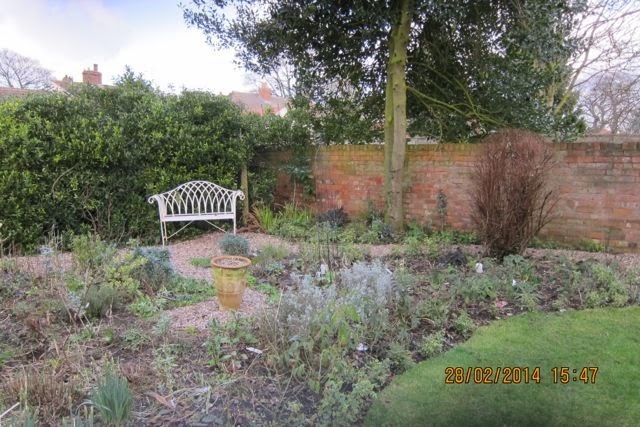 He has also done some edging so there are bits of the garden looking all crisp and tidy. The rest of the beds and borders all contain little fizzes of excitement, as new foliage emerges blinking into the light. 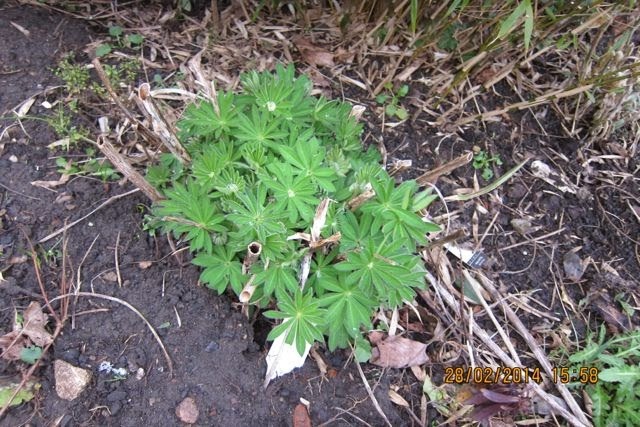 There are miniature lupin leaves, feathery Fennel and the shooting stems of Angelica. Every time I stop and really look, I notice something new in bloom, or just about to break bud. The Ribes is itching to take the stage, and the pink of the flowers can already be seen. 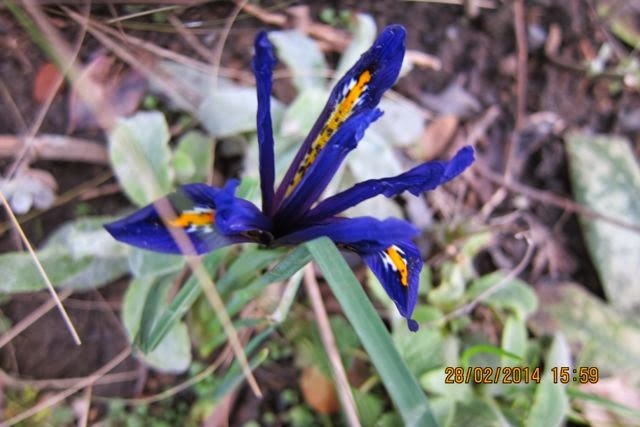 Kerria Japonica is just starting to flower, Mahonia, Pulmonaria, snowdrops, and bergenia are all out, while Iris Histrioides is ablaze with gorgeousness . Why can cameras never capture the true shade and intensity of purple and dark blue flowers ? 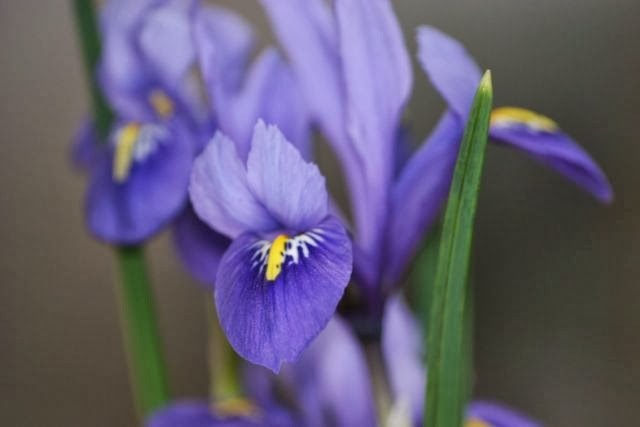 Iris Histrioides is the most glorious rich, dark indigo, yet through the lens, it becomes a washed out blue. I will grow more of this scrumptious plant next year and keep them in the greenhouse so that I can worship right up close and personal. 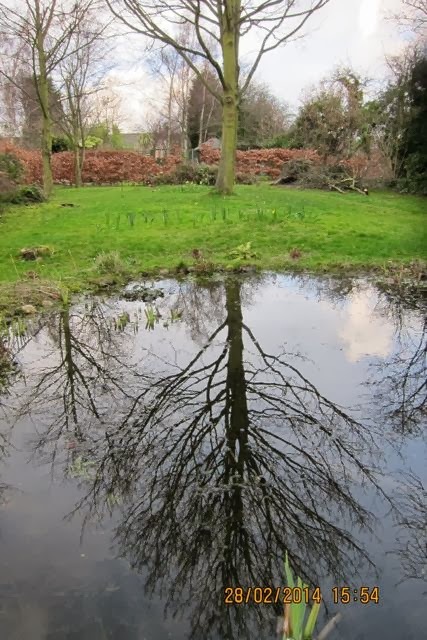 The daffodils we planted in the autumn are just coming into flower in the grass in the orchard, and there are some sweet 'Tete a tetes' in pots, and next to the pond. 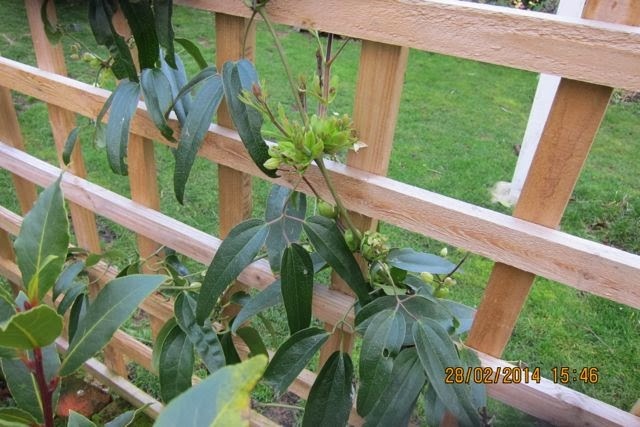 Clematis Armandii has been unchecked by the weather this year, so far, and is full of buds. Clematis Cirrhosa 'Wisley Cream' has been flowering for weeks now, and has been a joy. It is very delicate and easy to overlook, but well worth a closer look. Because this winter has been so mild, so far, casualties have been zilch. In many cases growth has not even been checked, and plants have kept their leaves, and in some cases kept flowering sporadically. So, if you fancy a peep into the greenhouse, there are lots of rose cutting coming out of winter dormancy and growing away strongly. There are pots of tulips, waiting for their turn to shine and the sweet peas are getting tired of being restricted in their little pots and are desperate to romp away. Nearly done now, we can go into the kitchen and put the kettle on, but we need to walk through the conservatory to do that, so we can see how the plants there are also waking up. The fuchsias , some three or four years old, are putting out fresh new foliage, and I have started to water them again. My initial thought was that I wouldn't be able to find enough blooms in the garden to drum up a halfway respectable post for 'Blogger's Bloom Day', because when I look out of the window, all I can see are tones of brown and green. 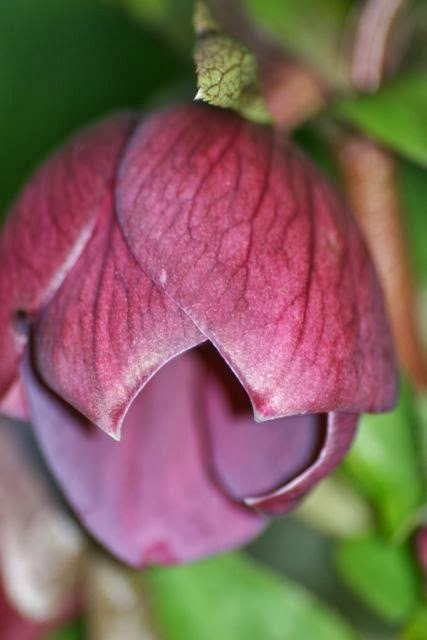 However, when I went outside armed with the macro lens, I was surprised how much there actually was in bloom. OK, we're not talking armfuls here, just tiny flowers dotted here and there amid the gloom, but enough to photograph. The star of this (limited cast) show is undoubtably Iris Histrioides, which is totally gorgeous. I saw a photo of one on someone else's blog recently, rushed out and bought 3 for the cool greenhouse, then found a couple growing in the garden, which I had planted in the Autumn and totally forgotten about. Good job I'm not a squirrel - I'd starve! 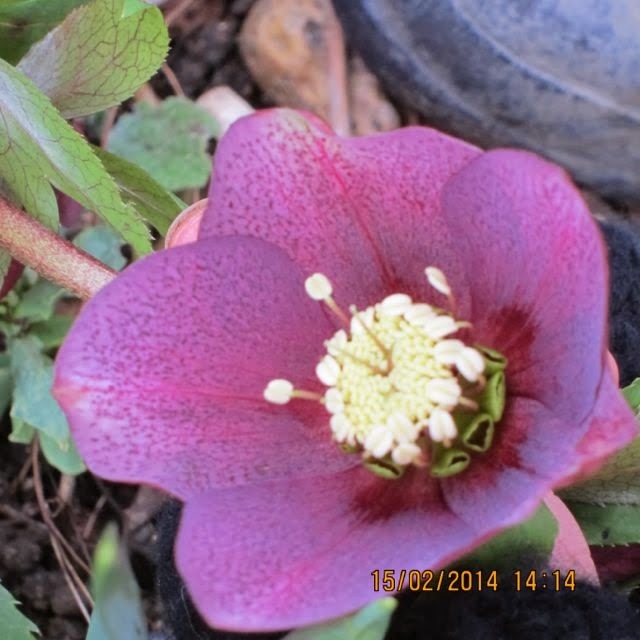 The Hellebores are coming into their best at the moment and I particularly like this speckled one. As I have never bought one, these must all have come from a couple of plants which were here when we moved in, over thirty years ago. I love the dark, rich reds of the buds before they open. This is the palest one I possess and I might do a bit of breeding from this one, later on, when it is ready for pollination. 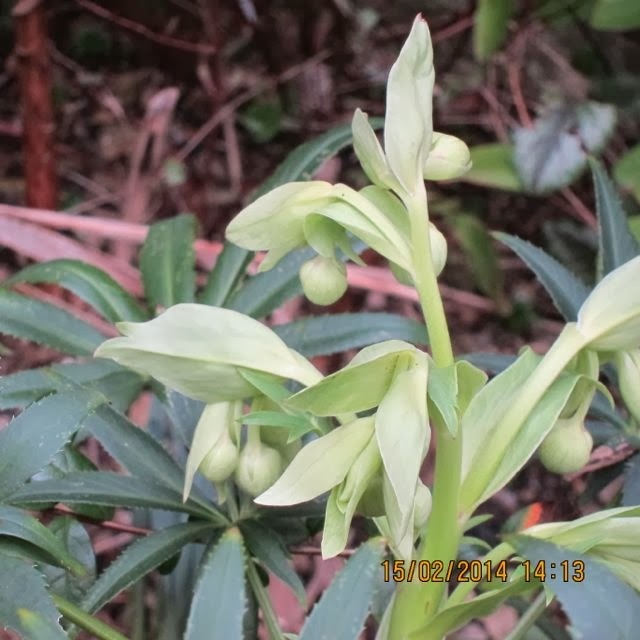 This Hellebore has very finely cut leaves, and has unusual pale buds and flowers. 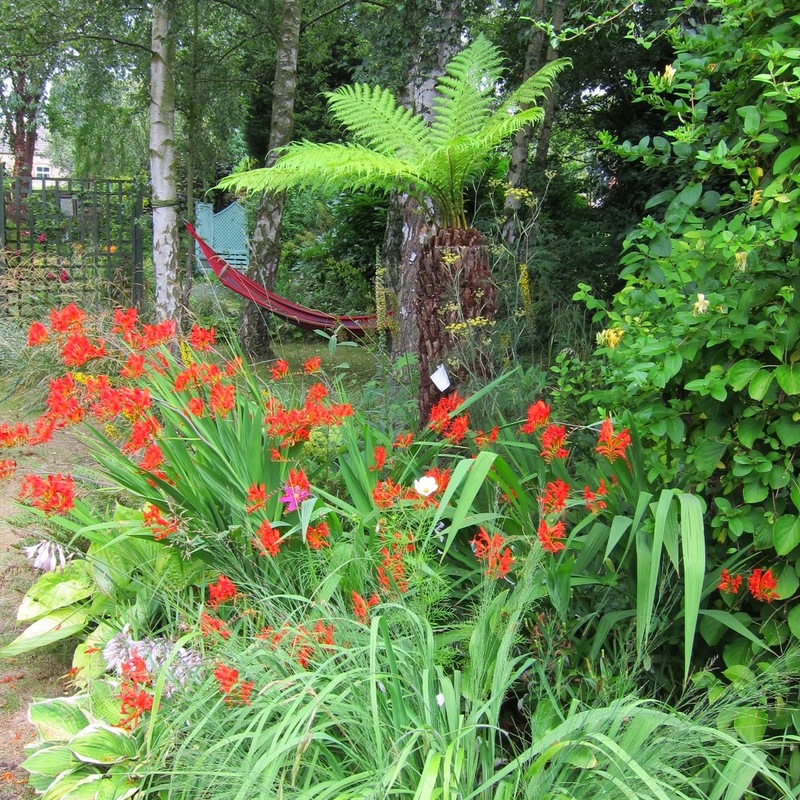 It stays looking good throughout the year, and is a real favourite of mine for shady places. I think it is Argutifolius, but am happy to be corrected, as I have never been sure what it actually is ! 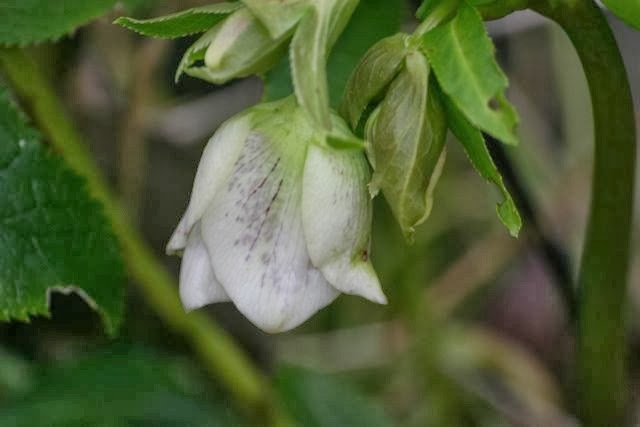 The delicate, bell like flowers of 'Clematis Cirrhosa Wisley Cream' are easy to miss, and look lovely as they blow in the wind. 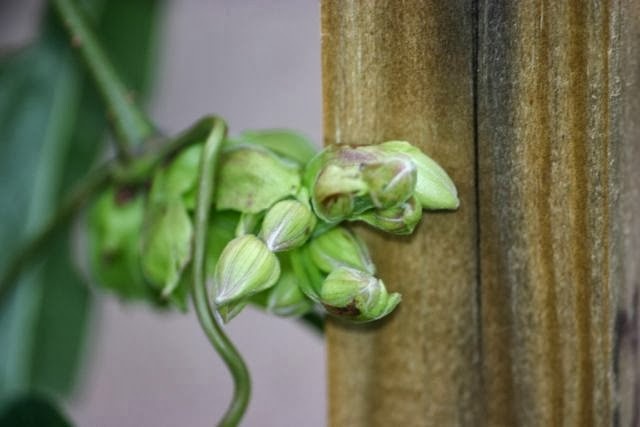 Clematis Armandii is not far behind, and those flowers should be opening in a few days. I have lost a couple of plants before, as they are tender, and haven't coped with the low temperatures over the last three winters. So far this Winter, there has been little weather cold enough to have a detrimental effect. I can't wait for the flowers to open and fill the air with fragrance. 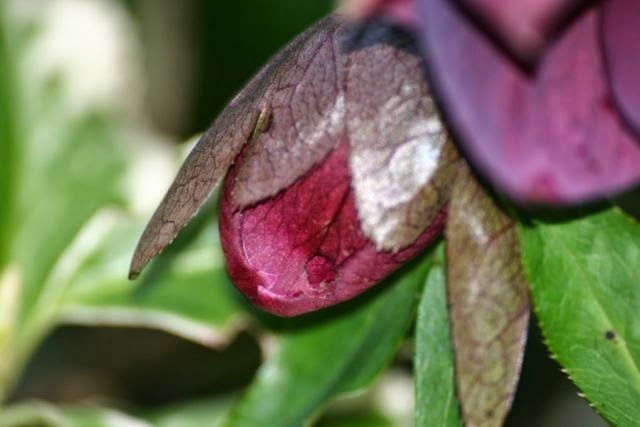 Not a bloom, but I couldn't resist this photo showing new growth in my summer flowering clematis 'Polish Spirit'. 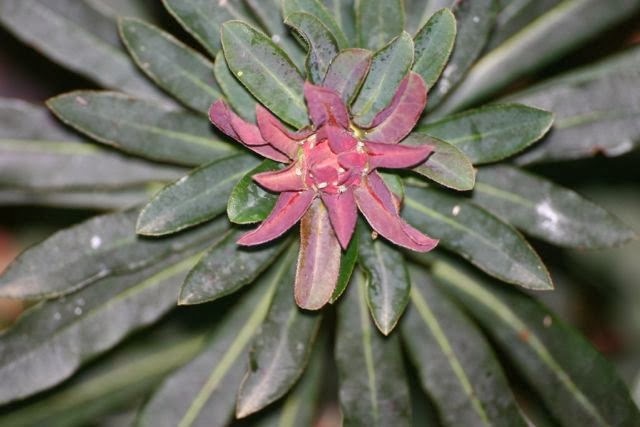 Most of my Euphorbias have been kickstarted into growth, and this Martinii is no exception. They provide a welcome splash of colour in the winter garden. You really can't ask for more from a shrub than you get with Viburnam Tinus - healthy evergreen foliage, vigorous growth, nice rounded habit and to cap it all, lovely white perfumed flowers, when very few shrubs are more than a collection of sticks ! 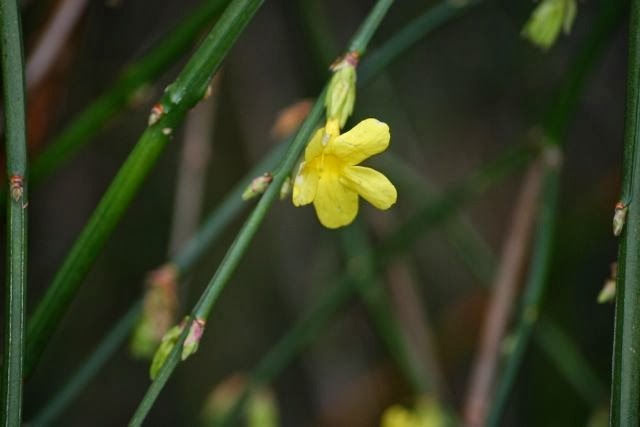 The winter Jasmine has been flowering for months already and shows no sign of stopping yet. It is planted near the back door so that we can see it every time we go out. I couldn't have a garden without including it. One of the cheeriest plants there is, it brightens up many a gloomy winter's day. Not technically blooming yet, but, oh , so close ... 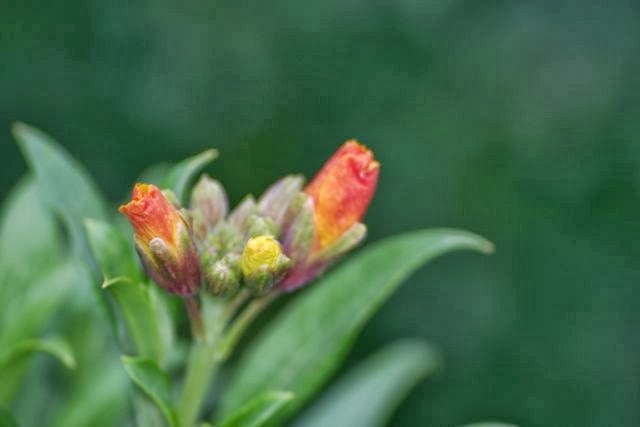 These wallflowers will be out soon and I swear I can smell them already! 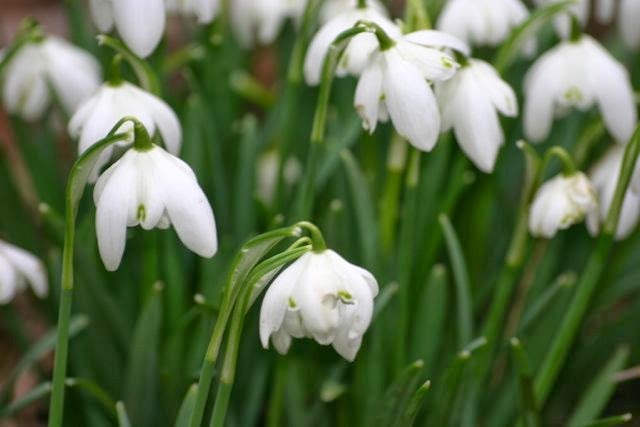 Early stalwarts, the Snowdrops, are well into their flowering period now, and at their peak. 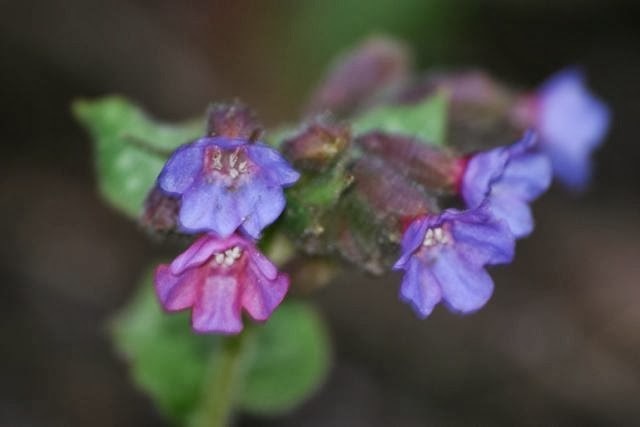 Apologies for poor focusing this photo, believe it or not, this was actually the best shot I got of these Pulmonaria ! Had to share it because they are newly out, and it is so lovely to greet them again! 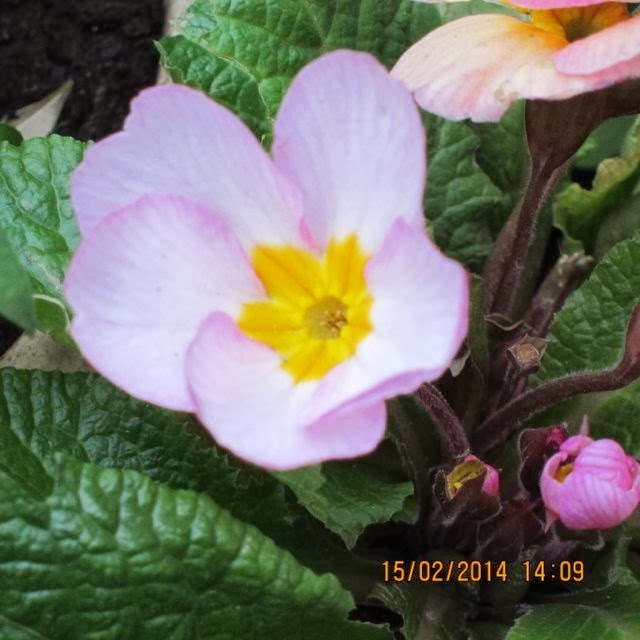 Bit of a cheat because I bought these Primulas from the local Garden Centre about 3 weeks ago, and they are in pots. However, they are in bloom, they are in the garden, so I guess they just qualify! 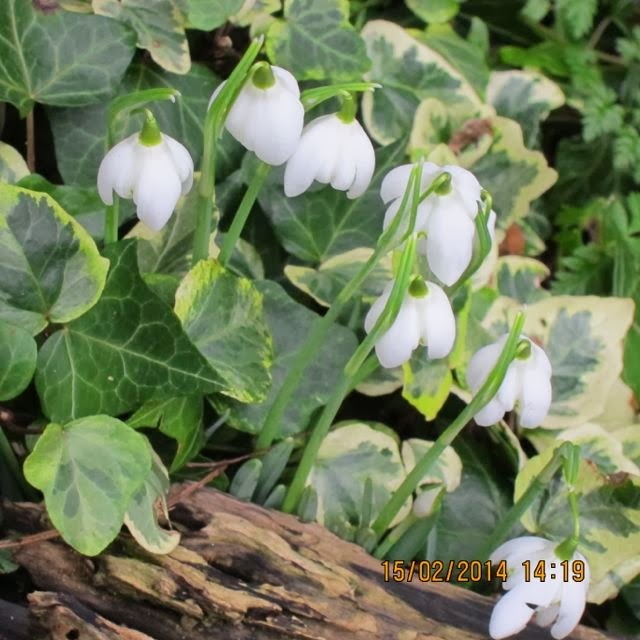 And the good thing about getting low down and dirty with your plants, is that you notice the small harbingers of Spring even sooner than you would otherwise ! But does it make the heart beat faster ? When I have a new gardening project, I spend a lot of time planning prior to doing anything else. Once I have drawn up a draft plan, I research to find the most appropriate plant/ variety, then ensure that I locate it at a reasonable price before purchasing. c. Already have a trolley full of plants you don't need"
So which voice do I listen to ? The voice of reason, or the voice of the Plantaholic ? No contest ! So, today saw me being uncharacteristically sensible and planting some little workhorses, which don't make my heart go zing, make my mouth water, or my pulse race a little faster. Today, I was planting the right plants for the right places. It was a case of mind over heart. Not that the plants I've acquired aren't good, they are all proven to be reliable. They're just boring! 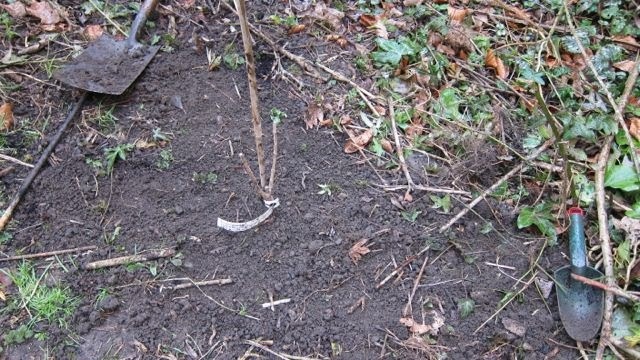 The bottom section of the garden, where we have our 'orchard' (half a dozen teeny fruit trees!) 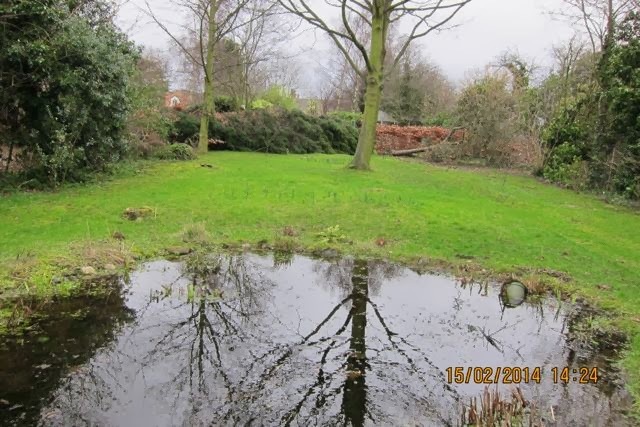 and wildlife pond, has boundaries which are mainly English natives, like hazel and elder. I don't recall them being planted, they just exist. Although there is very seldom another living soul anywhere near, I do value privacy, particularly when we are sitting down there with a bottle, erm, glass of wine, so, I decided to plant shrubs along the inside of the boundaries, to give privacy, structure and interest in the summer. Who cares about the winter ? 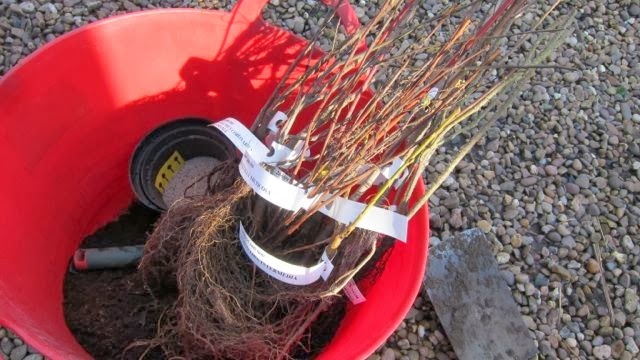 I had been musing on which shrubs to buy for a while, when, I got an email from a company offering bare root shrubs, 10 for £10.00. Come on, a pound each ! What can you buy for a pound ? Not even a loaf of bread. I thought about it with my head, not my heart. All these shrubs are tough, reliable, hardy, reliable, disease resistant, reliable and tolerant of conditions which may be less than perfect. I know, I know ... sterling shrubs which will do the job admirably. 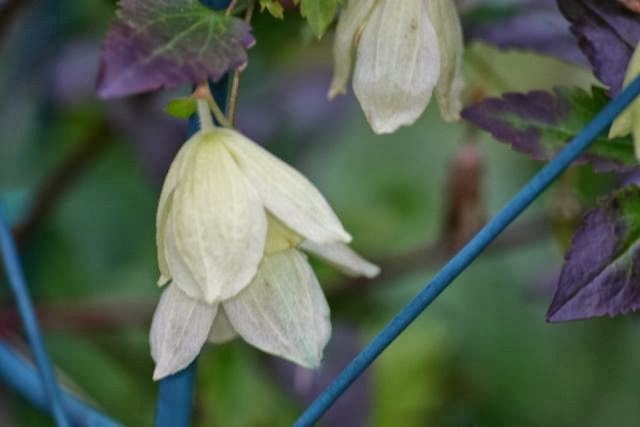 It's maybe unfair of me to brand them as boring, as I know that when the Philadelphus is filling the air with perfume, or I glimpse the rose pink flowers of the Ribes against the bare branches, it will give me great pleasure. But they don't make my heart beat faster! 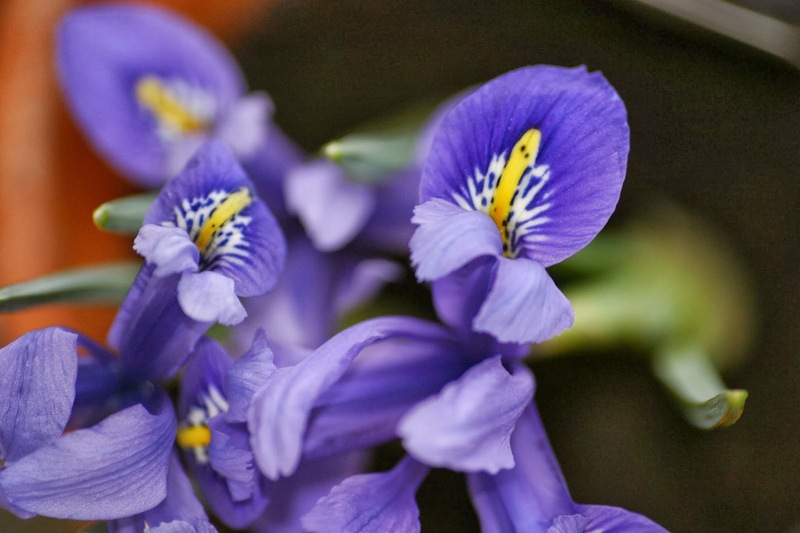 I planted them over about two hours, through an afternoon which went from sunny and Spring-like, to horizontal heavy rain from a leaden sky. Like a true gardener, I ignored the rain and carried on planting until I had finished. They all got a good start in what can be a dry, partially shady area. I dug a big hole for each, loosening surrounding soil, to make root growth easier. Bonemeal and lots of compost was added, as was a huge marker cane, so that they do not get cut down in their prime by the mower, later in the year. Then, muddy, wet and cold, I went to the greenhouse to plant things that DO make the heart beat faster. Bulbs ... exciting bulbs. 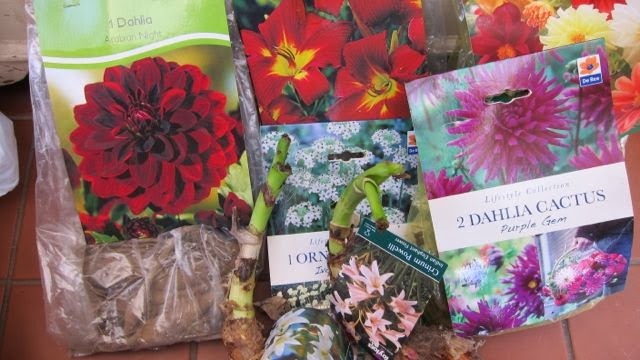 Over the last couple of weeks, I have bought 2 Hemerocallis 'Sammy Russell' (red with a yellow centre); various Dahlia tubers including 'Arabian Night' and 'Purple Gem'; 2 Crinum Powellii and 2 Ornithogalums Thyrsoides. 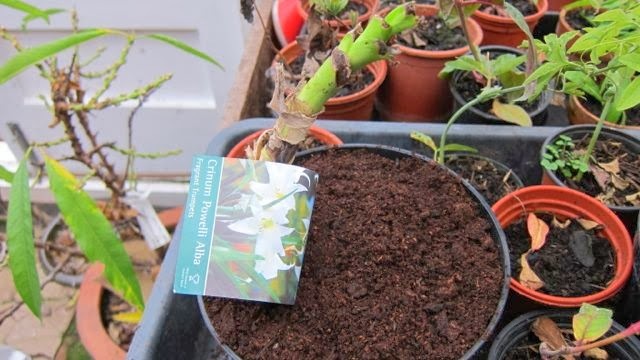 I wanted to pot up the hardier bulbs, then keep them in the greenhouse to give them a good start before planting out, later in the year. 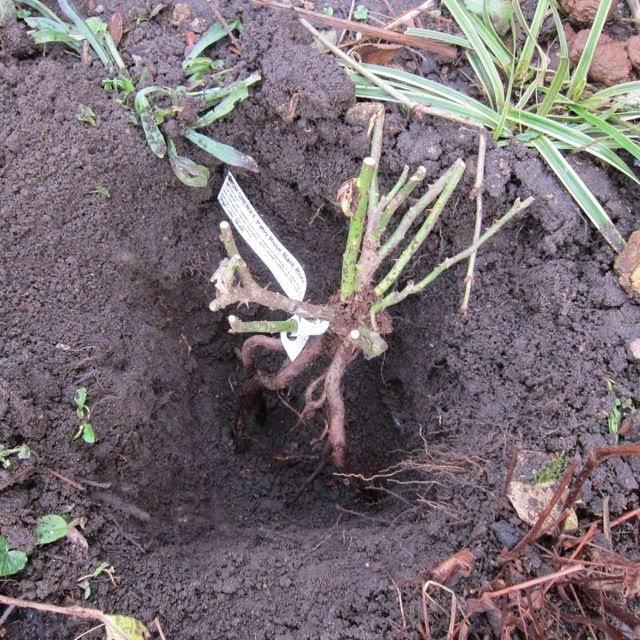 The dahlia tubers are staying in a dry, frost free place for a good while yet. I already have a pale pink Crinum which has been in the garden for many years, flowering profusely and reliably every time. It looks very exotic, yet has pulled through our hardest winters unscathed. I have looked for more, over the years, without success. Until now ! 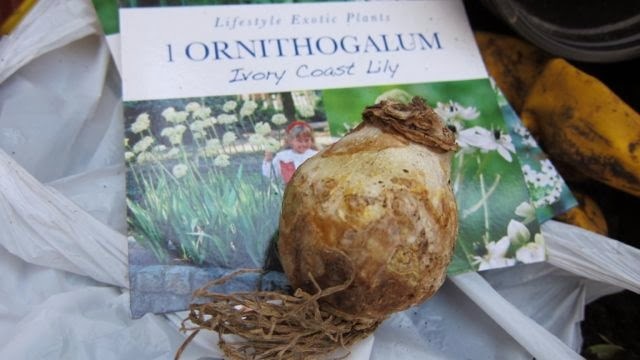 A new kid on the block is 'Ornithogalum' - a bulb which gives white flowers from June to October. Anything with a flowering period like that deserves a place in the garden, I think. It looks fantastic on the photo, so I hope it lives up to expectations. The main problem I have with Ornithogalum is ... the name ! I am determined to memorise it, and have to use the cue of 'Ornithology' to kick start those grey cells ! But the heartbeat escalates every time I look at my Rosa 'garden Party' seedlings ( more about these on So sow ? ). 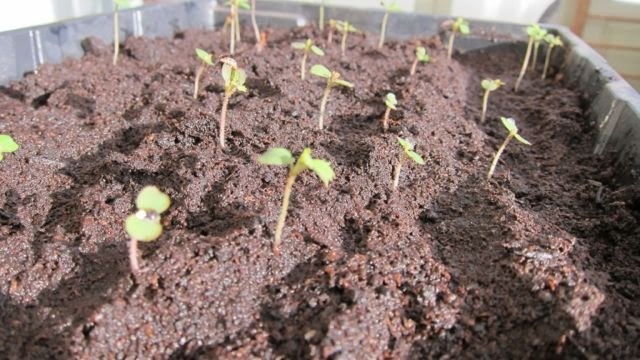 Despite having worries about poor germination after reading a review online, I already have a germination rate of over 75%, and this is only 'Month 1' of a 3 month germination period. 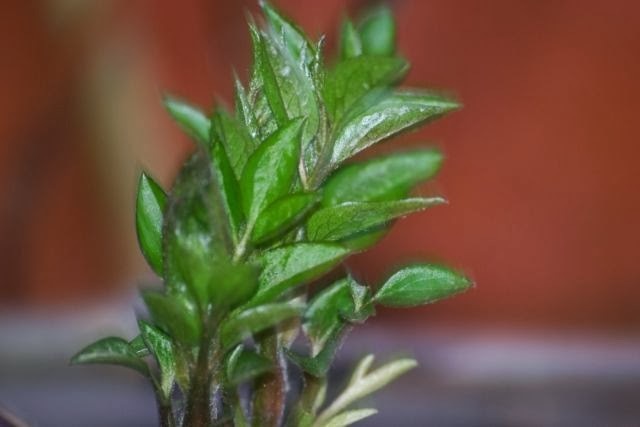 Some of the seedlings are already developing their first true leaves. Exciting ? I need a lie down in a darkened room now ! I think I have to own up to being a bit of a plant snob. There, I've said it now ! I'm not proud of it but I think I have to confess it. So, for some reason I have always lumped Patio roses with lobelia, bi-colour bedding plants and pink Hydrangeas. I have walked past them in the garden centre, ignoring them totally, heading straight to the giants - the English roses, with their tasteful pastels and evocative names. The Patio roses I did catch out of the corner of my eye, seemed designed for the gift buyer, with names like 'Many Happy Returns' and 'Celebration'. 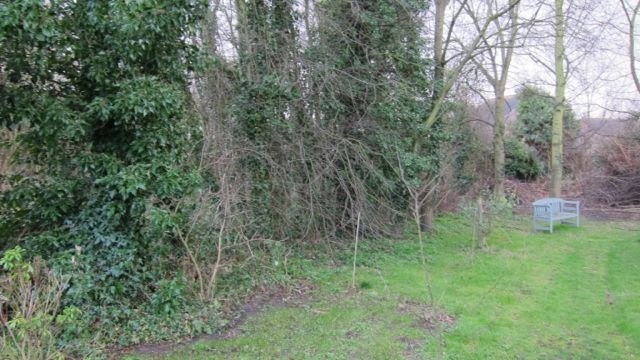 How could they compare with the elegance of 'Jude the Obscure' and 'This Sceptr'd isle' ? I think it was the word 'Patio' that put me off, as it conjures up, for me, the most depressing bits of suburbia, that weekly washing of the car, the twitching of the net curtains. It somehow wasn't the stuff that dreams are made of, not full of the romance of the Bourbon or the Damask. So, now I have to eat my words, letter by letter, as I have just spent the last two hours out in the freezing cold, planting seven new Patio roses. The February wind was literally whistling through the trees, and the soil was icy cold. What changed my mind was my love of a bargain, about as prosaic as a reason can be. No light bulb moment, no reading learned tomes ! I was mooching about on one of the many garden forums I belong to and a new message caught my attention. 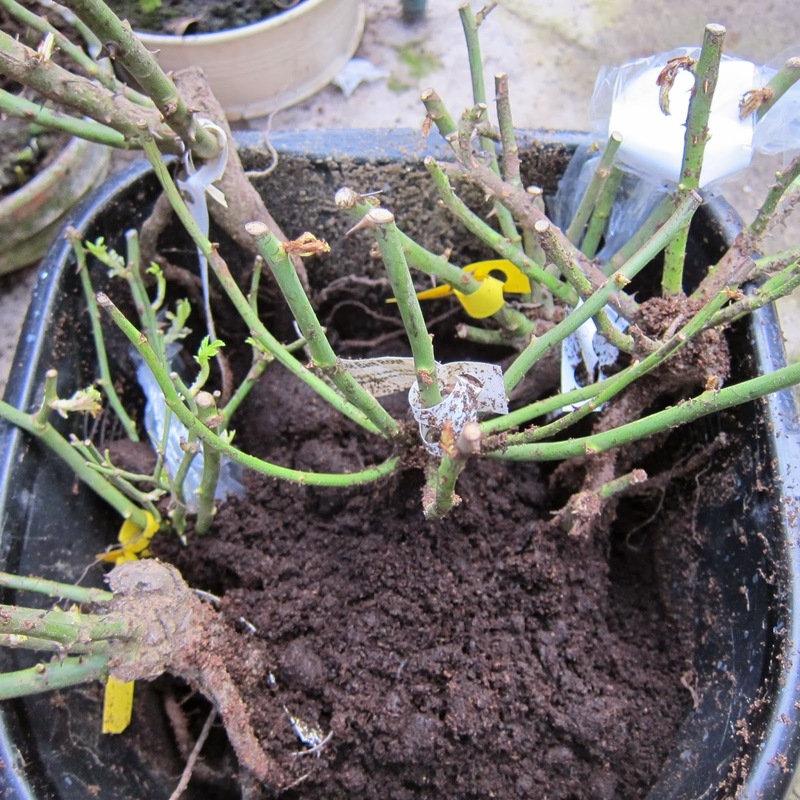 Someone posted to say that they had just bought Patio roses reduced from £9.99 each to £2.25. And that was all it took! 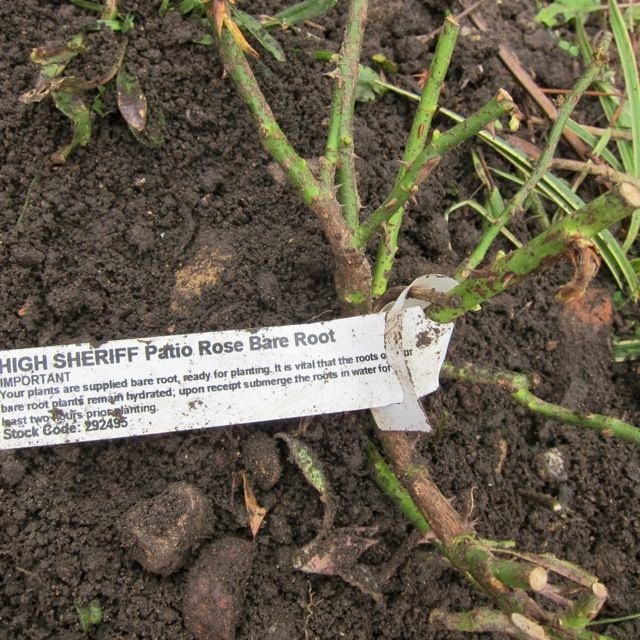 I went straight to the site and ordered seven bareroot roses without drawing breath ! While I was waiting for them to be delivered I started to read up on the origins of Patio roses, and was surprised by what I found out. Patio roses were given their name from around 1996 and are basically just small roses between 30cm and 90cm in height, although the definition does seem open to interpretation. 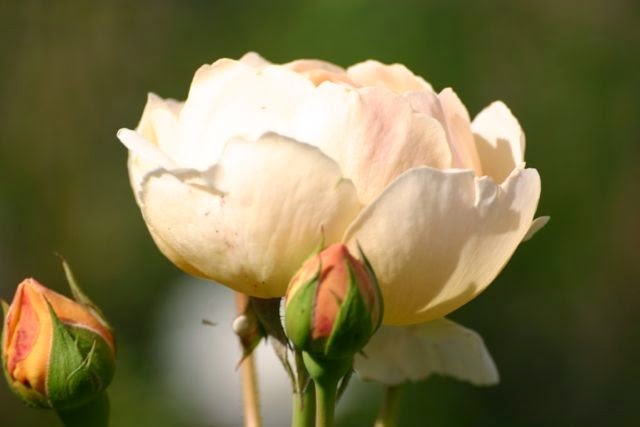 It includes various types of roses including the Polyanthas, which were mainly developed in the 1900's. 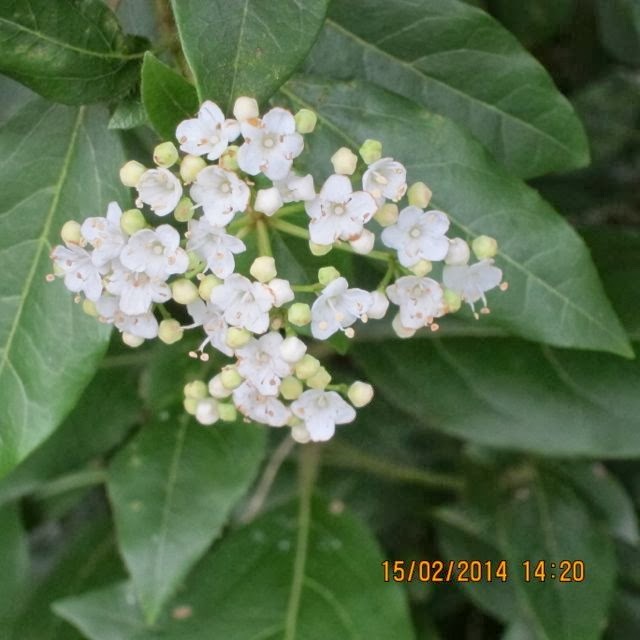 The majority have a long flowering season, with some blooming from May through to October. Flowers tend to be small and held in clusters, like Floribundas. Many were bred to cope well in a container. Miniature and dwarf roses are often referred to in recent years as Patio roses too. 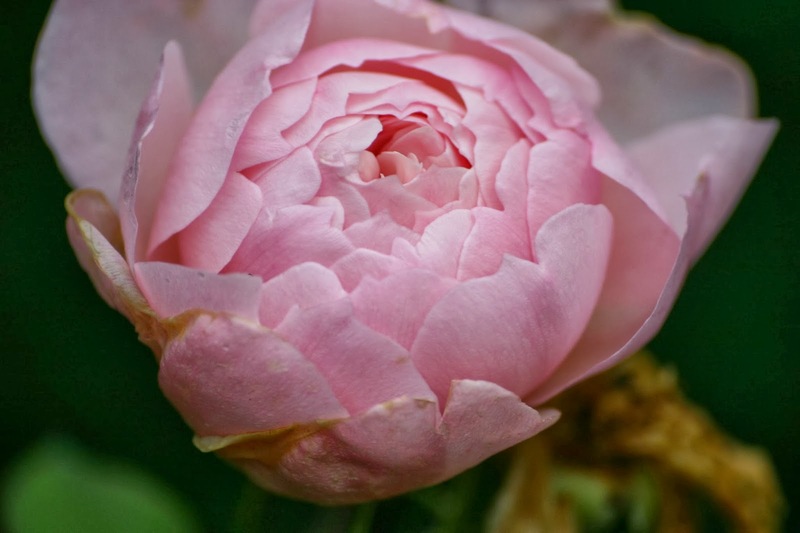 They come in a huge range of colours, and although they have a scent, it is nothing like as strong as Hybrid Teas or English roses. They are usually tough, compact and disease resistant. 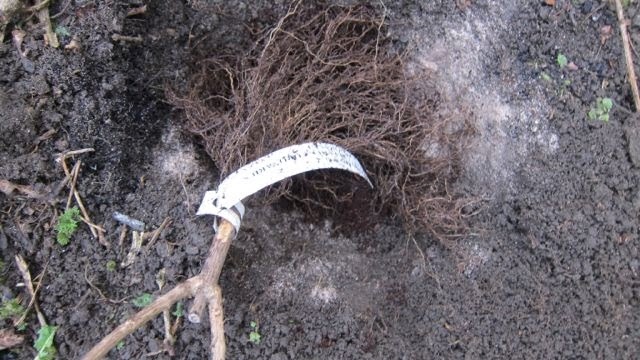 Although very suitable for container growing, they are good garden plants, ideal for edging or underplanting larger roses. When my little band of Patio roses finally arrived, it was raining so I couldn't get them planted, so I unpacked them and put them all in a bucket of water to rehydrate. The next day it rained again, and I was worried about leaving the bare roots in water for too long, so I emptied out the water and covered the roots with damp compost instead. A lazy woman's 'heeling in' if you will ! I woke today to see the sun streaming in through the window, and knew that this was my little window of opportunity to get planting, before those grey clouds built up again. After all the rain, the soil was very wet, and I had the dilemma of whether to work it or not. If I had a choice I would have left it alone, but the health of the plants depended on being planted, I felt. So, now they are all planted - big holes, Rose food, specific compost for roses and then a top layer of soil and a quick water. They are planted at exactly the same level that they were planted at before. I also remembered to write them all a label, which wrapped around a stem, rather than markers stuck in the ground, which are easily lost. Typically, there was a fatal flaw in my planning. 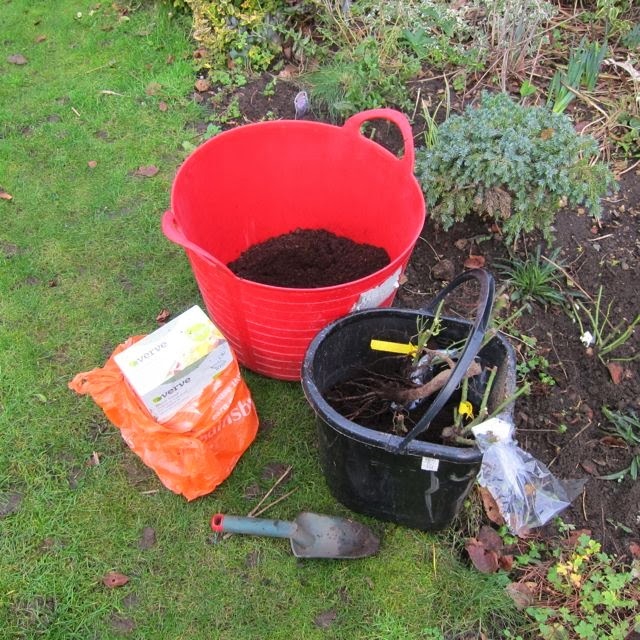 There I was, out in the cold wearing wellies, gloves, coat and scarf, all ready to dig the first hole, when I realised that I hadn't a clue what colour the roses were. Reluctant to go back up to the house, I played a bizarre game, where I tried to guess the colour based on the name. Some were a breeze, 'Cream Dream' - got it in one ! But what colour is 'Teenage Spirit' ? (Usually clear, like Vodka, if my memory of my own teenagers serves me well!) Turns out it is pink - I checked them all out when I got back into the warm. What colour would you guess for 'Well done', (one of the plants I have bypassed so dismissively in the past) ? I guessed red, you know, red rosettes and all that, but, no, turns out it is cream. 'Flower Power', I would have guessed was something bright and vaguely psychedelic, but that is pink. Now, I was reasonably confident that 'Sweet Dreams' would be a cream or a white, as it made me think of crisp sheets, and cloud-like pillows, but, no! Pink again! 'High Sheriff' ... something regal I imagined , like scarlet or deep crimson, but turns out it is a near white. 'Sheer Silk' ? Well, it says very pale pink to me, but it is actually white. My percentage of accuracy was extremely low ! Sadly, I fear that any colour co-ordination there may have been in the borders (and I can assure you that is very little) has now gone out of the window and there may be some very mis-matched neighbours blooming in the summer.